Harbor Town – The kids wanted to spend as much time as they could at the beach, so more often than not, that’s where they were today. 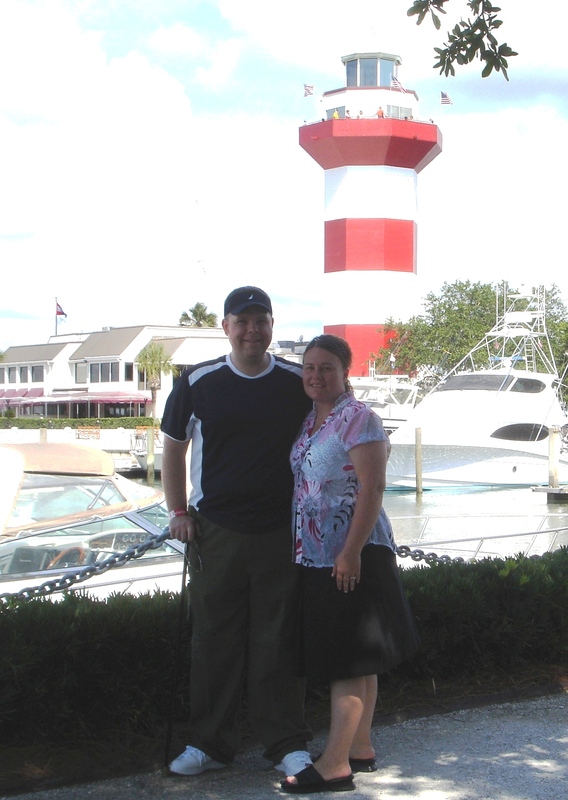 Shannon and I wanted to see the local lighthouse at Harbor Town which was just a short drive from our villa. There were many small shops and a quaint little harbor, but the view of the harbor, from the top of the lighthouse was breath-taking. I was able to negotiate the 114 steps up and was it ever worth it. Every few steps, there was a landing where you could read about the history of the island, which provided me with an opportunity to take a break while making the climb with my cane. There was a small fee to gain access for the day to the Sea Pines Resort where the lighthouse was located ($5.00/day/car) and another fee for going up into the lighthouse ($3.00/person). 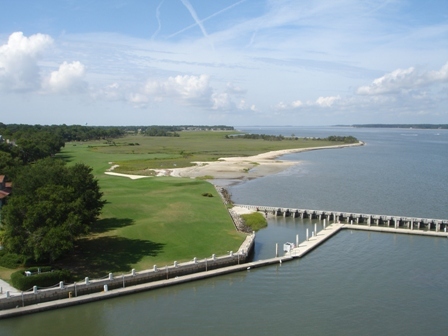 The views were not only of the harbor, but of the ocean, and the 18th hole of the Sea Pines Resort. You can view the web cam HERE to see almost the entire area surrounding the lighthouse. Murphy’s Fish ‘n’ Chips – One of my favorite dishes of all time is fish and chips. When reading up on some of the local flavor in Hilton Head I stumbled upon an ad for Murphy’s Irish Pub and Restaurant. Mr. Murphy states in his ad that he’s from Ireland and serves authentic Irish cuisine including fish and chips. I was immediately “hooked.” So for lunch, Shannon and I head to Murphy’s and were the only people there. In fact, Murphy was the gent that waited on us. True to his ad, he was in fact an Irishman, and his fish and chips did not disappoint. Made with cod fillets, they were scrumptious. He tended to our every whim. He took our order, cooked, served it, visited with us some, and was very pleasant. He kept smiling a “wee” smirk. I think he was tickled that I told him we were putting his fish and chips to the test. The place was a bit small, and more pub than restaurant. We were the only guests there so it was quaint and quiet. We enjoyed visiting with Mr. Murphy and watching his feed from the UK of a soccer tournament while we ate. Plus, in the background he was playing Irish/Celtic music. I know we were in Hilton Head Island, but for a few moments we felt like we were in Ireland. Murphy says he appeals to a smaller crowd and is considered a stepping stone to larger restaurants and pubs in the area. He doesn’t mind he said, it keeps the atmosphere more family friendly. Incidently, our bill with (2) meals and (2) iced teas came to about $22.00. Salty Dog Café – Later we took the kids to the Salty Dog Café where we had some ice cream and took in some of the sights. 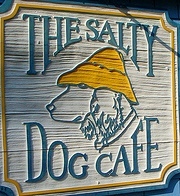 We were told, anyone that goes to Hilton Head Island, MUST go to the Salty Dog. It was a quaint outdoor café with a souvenir/general store. The ice cream was excellent, but a little on the costly side. There is a webcam here as well that is located next to the thermometer in the café. There are two red-painted foot prints to stand on to be in view of the webcam. In addition to the Salty Dog Café, there is a Salty Dog T-shirt Outlet. The kids chose to pass up on the T-shirt or any of the souvenirs.